Recently we had a new client visit the Balance salon with a hair crisis. She came to us with extremely damaged hair from a salon in the Washington DC area. Our Artistic Director Trisa worked closely with her to best restore her hair's health and style. After a good cut and conditioning treatment, they decided on Dreamcatchers Hair Extensions to give her long flowing locks again. Trisa carefully matched the color and wave of her existing hair. Within a few days (using rush service), our client had an envious head of loose blonde waves. Take a look at these dramatic before and after photos. Before Photos: Our new client came in with extremely damaged hair from another salon. 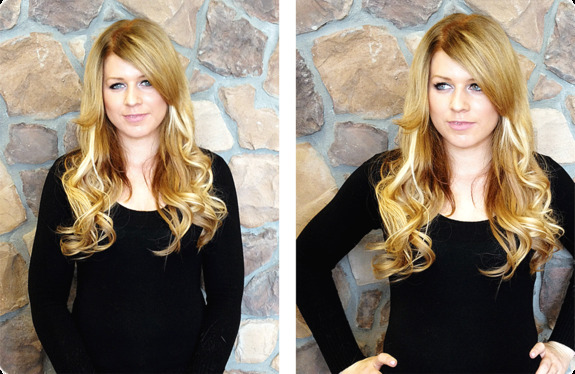 After Photos: Our client loves her new Dreamcatchers Hair Extensions.Considering hair extensions for yourself? Add length to your hair. Or add body and fullness to fine, thin or thinning hair. 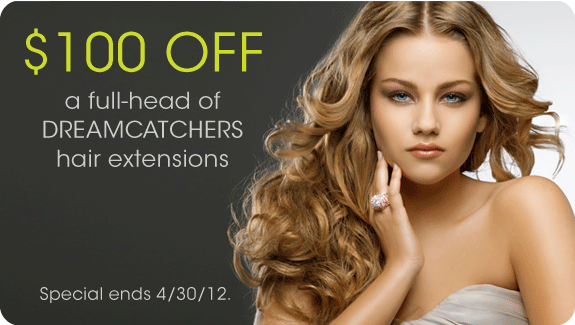 This month, don't miss our incredible special — $100 OFF a full-head of Dreamcatchers Hair Extensions with Trisa! Hurry in for your consultation today, this special ends on April 30, 2012. Request an appointment.